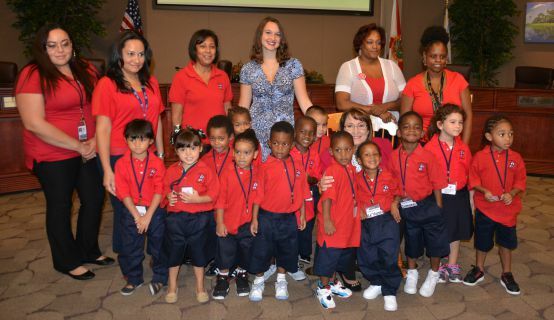 More than a dozen children from Orange County’s Head Start program joined Mayor Teresa Jacobs recently in the Board of County Commissioners Chambers for a reading of Where the Wild Things Are by Maurice Sendak. The reading took place in support of Just 1 Book, a charity that collects and distributes books to children in need, including Head Start Programs and other community organizations. Founded by Sarah Dewitz when she was only 10 years old, Just 1 Book has donated more than 200,000 books to children in Florida since its founding in 2010. The charity is thriving and plans to expand services to New Jersey this year. Reading to children is vital to their development. In fact, reading to a child for at least 10 minutes a day can significantly impact their literacy. Mayor Jacobs hopes to encourage parents to read to their children daily, to help give them advantage upon starting school. Orange County has proudly supported Dewitz throughout her charitable journey, including the donation of the Just 1 Book Mobile, the van used to distribute books to families across Central Florida. Head Start is a readiness program that provides comprehensive education, health, nutrition, and parent involvement services to pre-school children from low-income families. Photos from the reading are available on Flickr for use by the media.